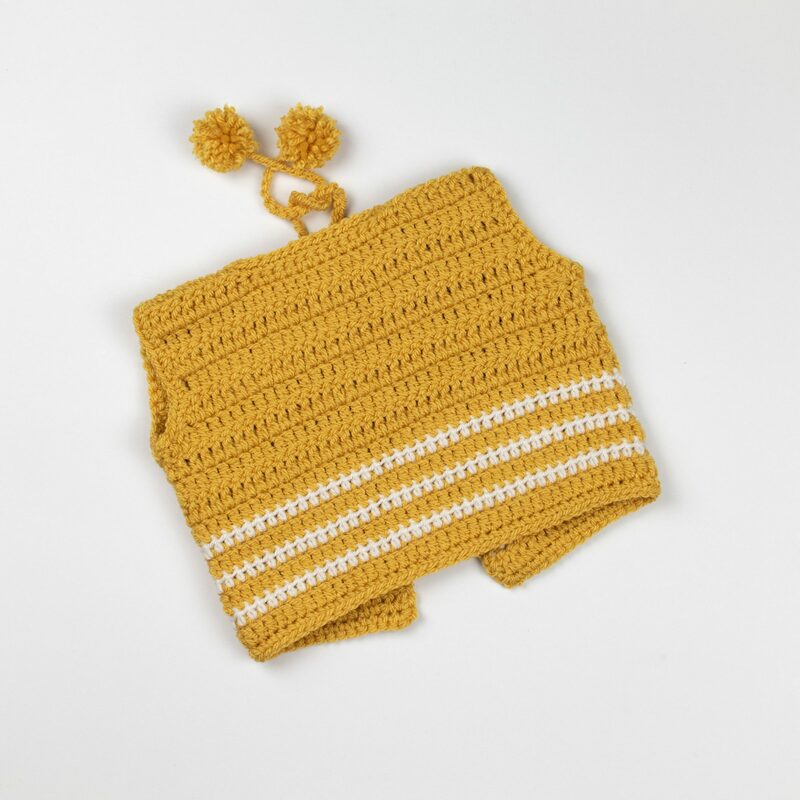 Crochet baby items are great projects for any time of the year. You don’t need a lot of yarn or time to make them from start to finish. If you are a skilled crocheter, a few episodes of your favorite series and a coffee later, and you’ve made a new pair of crochet baby shoes, a cardigan or a beanie that you can give someone as a gift or use for your own kids. 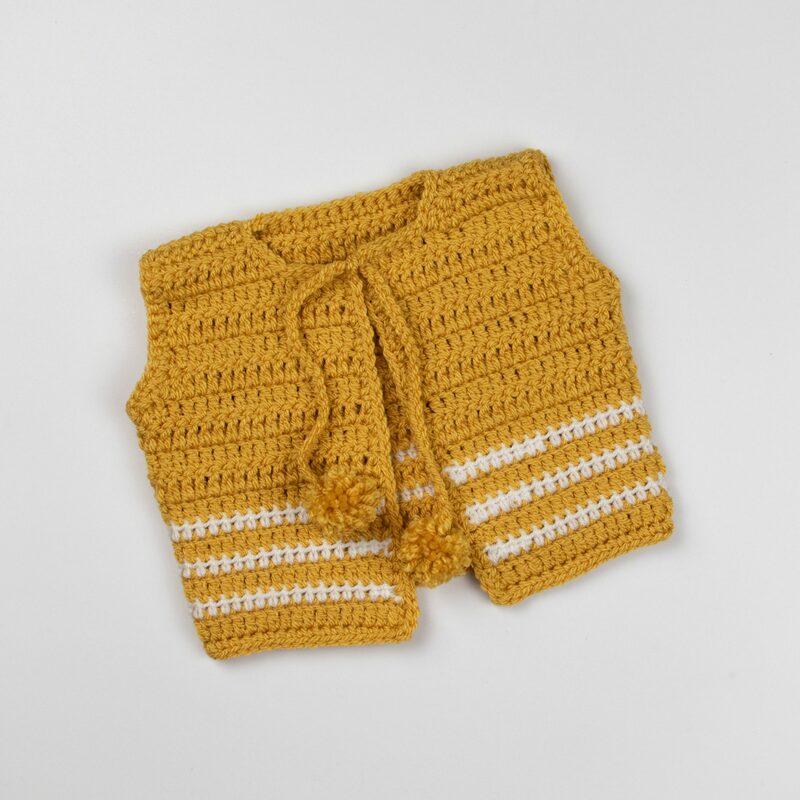 Today I am going to share with you a simple crochet pattern for a baby cardigan. 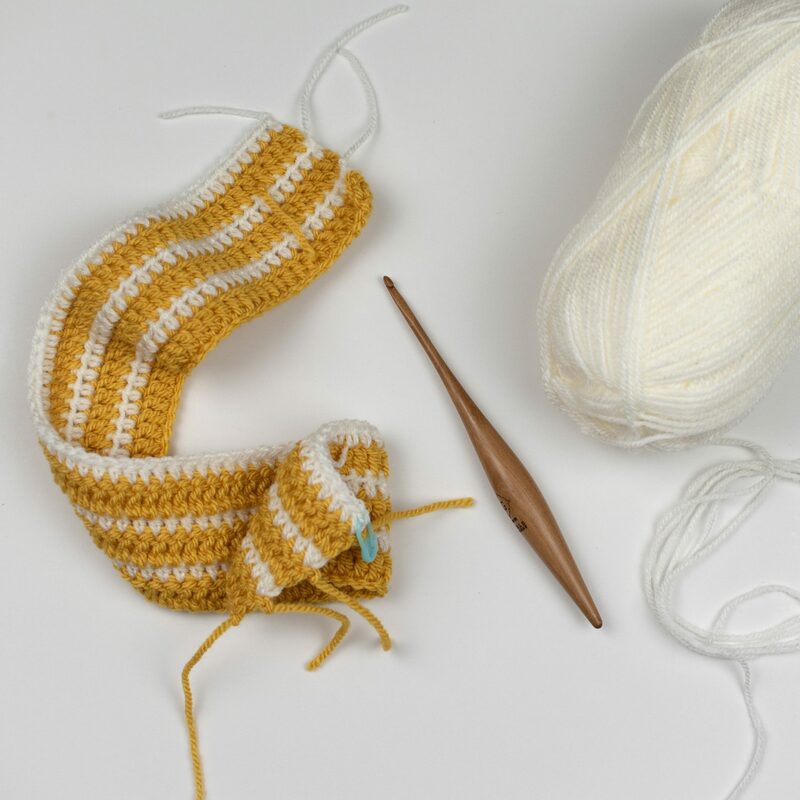 The pattern is made with a beautiful Pinbox Yarns Simply DK 100% acrylic yarn in shades mustardy yellow and champagne white. The pattern itself is pretty basic and beginner friendly. I’ve started with the lower part that was made in one piece and then separately made each of two front panels and the back upper panel. PLEASE NOTE: The written pattern has been updated since the original release. There might be a difference in a stitch count between the written pattern and a video tutorial. The video tutorial will help you understand the basic techniques used in the project, but please always check if the stitches are correct in the written instructions. You can find the original pattern here. Watch the video and follow the step by step tutorial to learn how to make this crochet baby cardigan from start to finish. Please consider subscribing to my YouTube channel(HERE!) and turn on post notification so you won’t miss any of my future videos. YARN: For this pattern, I was using DK weight yarn Paintbox Simply DK in shades Mustard Yellow (123) and Champagne White (102). The yarn is super soft and is available in so many beautiful colors. It is 100% acrylic yarn, which is not something I usually use for my crochet projects because I am not a big fan of acrylic yarn in general, but like I’ve mentioned in my Paintbox Yarn Haul Video; Paintbox acrylic yarn is actually a very decent yarn and super fun to use. I would definitely recommend it. CROCHET HOOK: 4.0 mm or G/6 crochet hook. YOU WILL ALSO NEED: a pair of scissors (HERE! ), stitch markers (HERE! ), a yarn needle (HERE!). 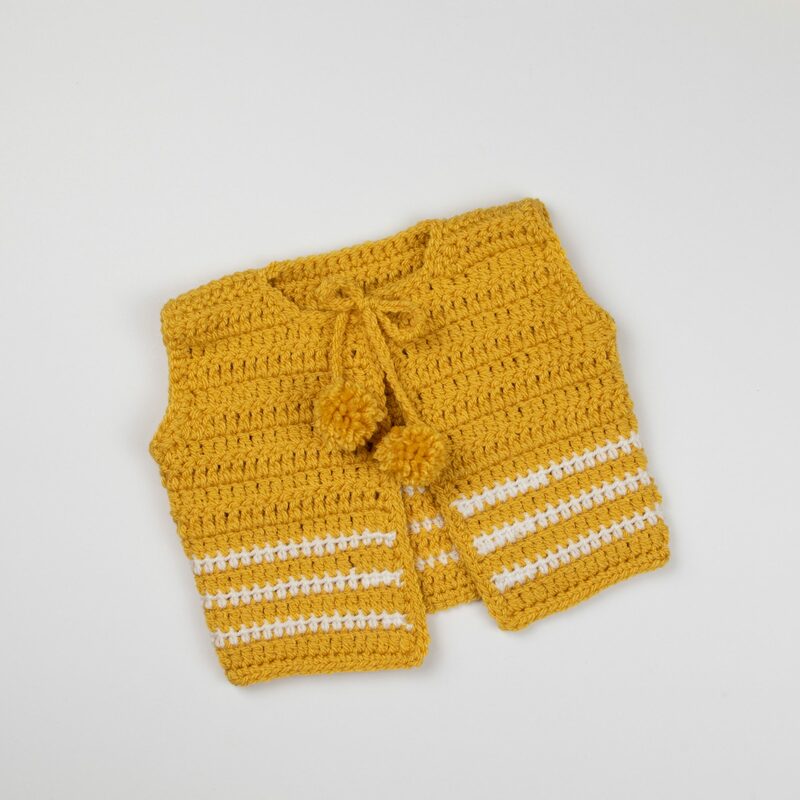 SIZE: 0 – 6 months (below) and 6 – 12 months (PDF pattern only). 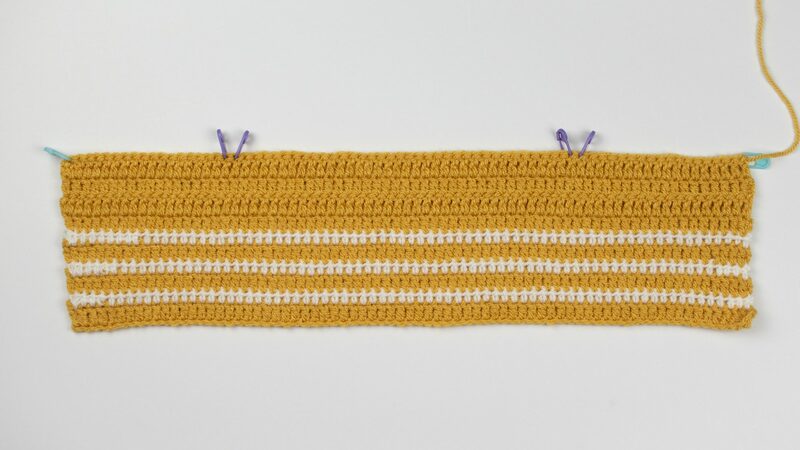 GAUGE: Work 8 1/2 sts and 6 rows in HDC using 4.0 mm crochet hook and DK weight yarn measure 5 x 5 cm (2 x 2 inches). Use stitch markers to indicate your important stitches (first stitch of the row/round, where to start the next segment of the pattern …). If the number is written before the stitch 3 hdc work 3 hdc into the same stitch. If the number is written after the stitch hdc 3, work hdc into next 3 stitches. Repeat what is written in the () as many times as it’s written right after the (). For an example: Repeat (2 hdc, hdc 1) 5 times. It means that you have to repeat the sequence work 2 hdc sts into the same st, 1 hdc into the next one 5 times. And you will get 5 additional stitches by doing that. The chain at the beginning of the round/row does not count as a stitch unless otherwise stated in the pattern. The slip stitch is just a joining stitch and does not count as a stitch in the pattern. The pattern is written in US crochet terms. Measurements: 0 – 6 months – waist 42 cm (16 1/2”) and length 21 cm (8 1/2”). PIN this pattern to your favorite crochet Pinterest boards for later HERE. 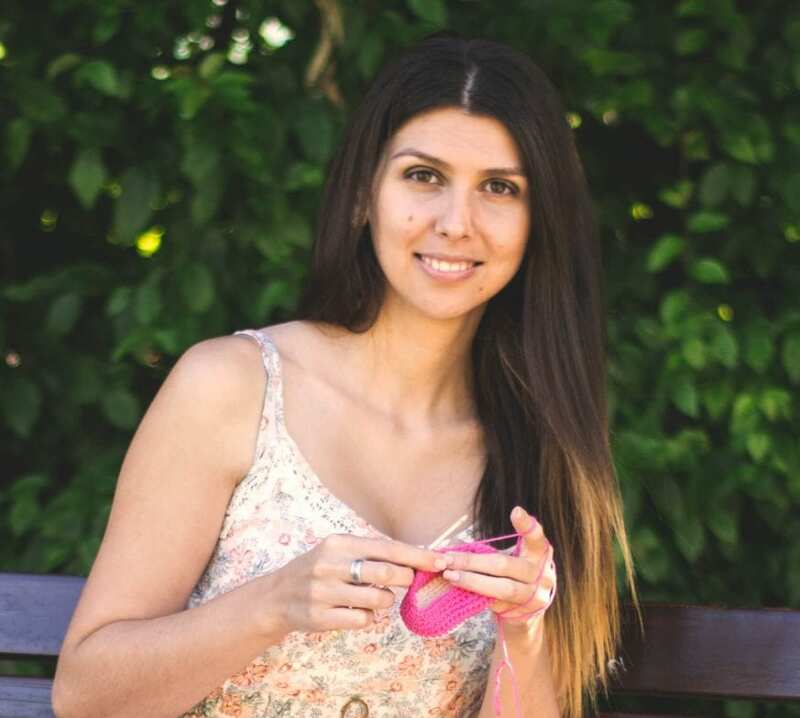 Follow me on Love Crochet and get updates when I post new patterns HERE. 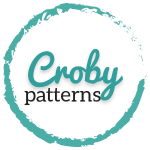 Share your work with me on social media using #crobypatterns. 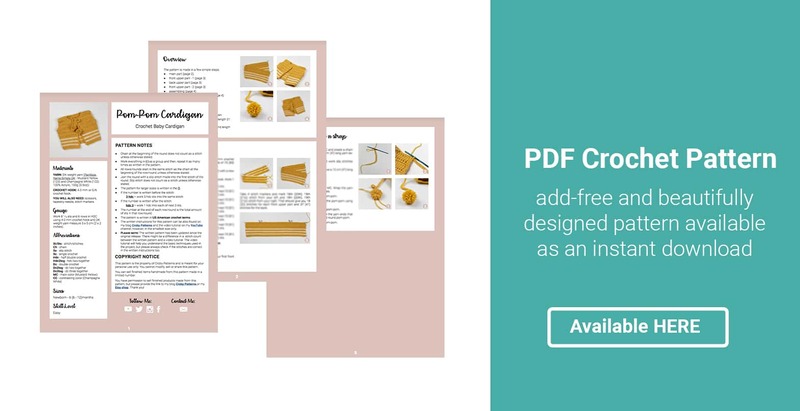 For those of you who prefer to work offline or would like to have a copy of the pattern for their own crochet library, I make all my patterns available in printable PDF format for a small convenience fee. You can find those patterns in my Etsy, Ravelry and Love Crochet shop. The fee compensates the ad revenue I would make if you had to visit the site to access the instructions. Some of the patterns available in my shop include additional sizes or shapes. Take some DK weight yarn and a 4.0 mm crochet hook and create a foundation chain made of 75 chains. Work in rows. After each row turn and start with a new one. Row 1 (MC): Start in the 3rd ch from the hook. Work 1 dc into each of next 73 sts. Turn. = 73 sts. Row 2 (CC): Ch 1. Work 1 hdc into each of next 73 sts. Turn. = 73 sts. Row 3 (MC): Ch 2. Work 1 dc into each of next 73 sts. Turn. = 73 sts. Row 4 (CC): Ch 1. Work 1 hdc into each of next 73 sts. Turn. = 73 sts. Row 5 (MC): Ch 2. Work 1 dc into each of next 73 sts. Turn. = 73 sts. Row 6 (CC): Ch 1. Work 1 hdc into each of next 73 sts. Turn. = 73 sts. Row 7 (MC): Ch 2. Work 1 dc into each of next 73 sts. Turn. = 73 sts. 3 more times for the 0 – 6 months. Do not cut the yarn just yet. Start with your first front upper part of the cardigan. Take 4 stitch markers and mark 18th (20th), 19th (21st) stitch from your left and 18th (20th), 19th (21st) stitch from your right. That should give you 18 (20) stitches for each front upper part and 37 (41) stitches for the back. Continue working in rows. After each row turn your work and start with a new row. Row 1 (MC): Ch 2. Dc 15. Dc3tog. = 16 sts. Row 2 (MC): Ch 2. Dc2tog. Dc 14 sts. = 15 sts. Row 3 (MC): Ch 2. Dc 15. = 15 sts. Row 4 (MC): Ch 2. Dc 7. Dc3tog. = 8 sts. Row 5 (MC): Ch 1. Sc 8. = 8 sts. Cut the yarn and fasten off. Leave a long tail for sewing. Insert the hook into the next marked stitch. Work in rows. After each row turn your work and start with a new row. Row 1 (MC): Join with the main panel. Start in the first. Ch 2. Dc3tog. Work 1 dc into each of next 31 sts. Dc3tog. = 33 sts. Row 2 (MC): Ch 2. Dc2tog. Work 1 dc into each of next 29. Dc2tog. = 31 sts. Row 3 (MC): Ch 2. Work 1 dc into each of next 31 sts. = 31 sts. 2 more times for the 0 – 6 months. Row 4 (MC): Ch 2. Dc 8. Hdc 1. Sc 13. Hdc 1. Dc8. = 31 sts. Row 5 (MC): Ch 1. Hdc 8. Sc 15. Hdc 8. = 31 sts. Cut the yarn, fasten off and weave in the ends. Row 1 (MC): Join with the main panel. Start in the first. Ch 2. Dc3tog. Work 1 dc into each of next 15 sts. = 16 sts. Row 2 (MC): Ch 2. Work 1 dc into each of next 14 sts. Dc2tog. = 15 sts. Row 3 (MC): Ch 2. Work 1 dc into each of next 15 sts. = 15 sts. Cut the yarn and fasten off. Weave in the yarn tail. Row 4 (MC): Skip first 5. Start in the next. Join with the main piece. Ch 2. Start in the same. Dc3tog. Work 1 dc into each of next 7. = 8 sts. Row 5 (MC): Ch 1. Work 1 sc into each of next 8. = 8 sts. Cut the yarn, fasten off and leave a long tail for sewing. Line up the straps; 8 sts on the top of each front panel with 8 sts on each side (left and right) on the back upper panel. Thread the yarn end that left on the front upper panel and join those 8 sts from each panel with a few simple sewing sts. Secure the yarn end between the sts. Repeat the steps for the second strap. Take some DK weight yarn in MC. Join the yarn to the bottom of the armhole and work sc stitches evenly around the armhole. Work 1 sc into each row that starts with a sc or hdc st and work 2 sc sts into each row that starts with the dc st.
Join the round with a slip stitch. Cut the yarn and fasten off. Weave in the yarn ends. Take a small amount of DK weight yarn in MC. Join the yarn in one of the upper corners of the cardigan (collar) and continue working sc sts evenly down to the first lower corner, then continue along the bottom and up towards the second upper corner. Cut the yarn and fasten off. Weave in the ends. Work 3 sc sts into each of lower corners to make them nice and round. Take a small amount of yarn in MC and create a chain made of 28 chains. Leave a 10 cm (4”) long yarn before you start with your first ch. Join the chain on the collar and work slip stitches evenly around the entire neckline. End the strap with 28 chains. Leave a 10 cm (4”) long yarn tail at the end of the strap. Take a small amount of yarn in MC. Wrap the yarn around two of your fingers 28 times. More wraps equal more fluffy pom-pom. Tie a knot around the middle of the pom-pom using the yarn end from your strap. Cut the yarn on both sides of the pom-pom. Create a nice and firm knot. Trim the yarn ends that are too long and create a nice and round pom-pom. Repat the steps for the second pom-pom. And your adorable baby cardigan is now complete. Don’t forget to share your blankets with me on Instagram and Facebook using the hashtag #crobypatterns or #crobypatternsStories to be featured in one of my Insta Stories. I can’t wait to see them!! Hi there! All the content you can find (including crochet patterns) here on this website crobypatterns.com is a property of Croby Patterns. I put a lot of work and love into creative ideas, patterns and educational materials provided on this website, so please do not modify, copy, sell or share it as your own. I do not give any permission to translate, make videos or crochet courses using content provided on crobypatterns.com. You can sell finished items handmade from my crochet patterns made in a limited number, but please credit the design to me, Croby Patterns and provide a link to my blog crobypatterns.com. Thank you for respecting me and my work!